A quick snack that kids of all ages enjoy. Begin with a package of frozen edamame. Be sure to get organic, non gmo since soybeans are one of the most highly genetically modified crops. Follow directions on package and either boil or steam pods for the specified amount of time. Once pods are drained of all liquid, place them in a medium sized bowl. Give the pods a few cracks of black pepper, several cracks of sea salt (or approx. 1/2 - 3/4 tsp). and sprinkle with approx. 1/2- 3/4 tsp. red pepper flakes. Drizzle with olive oil and stir well so all pods are coated with pepper, salt, red pepper flakes, and olive oil. Taste test a pod by placing in your mouth then running teeth across top and bottom to "pop" out the beans. Add more seasoning if necessary. 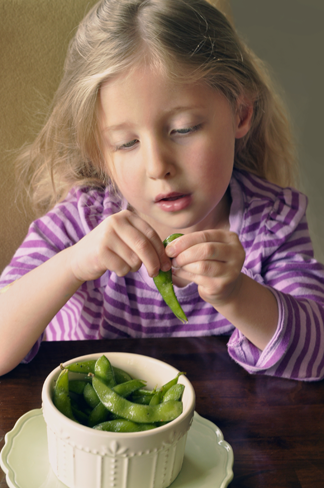 My daughter loves picking each little bean out of the pod. Surprisingly, it keeps her patient and quiet - not an easy accomplishment for a 3 year old!